Yesterday, Warner Bros. announced that the new Justice League trailer will debut tomorrow, Saturday, March 25, to commemorate the one-year anniversary of Batman v Superman: Dawn of Justice. The studio also released three brief trailer previews and posters, each of which centered on a specific character, Aquaman (Jason Momoa), Batman (Ben Affleck) and The Flash (Ezra Miller). 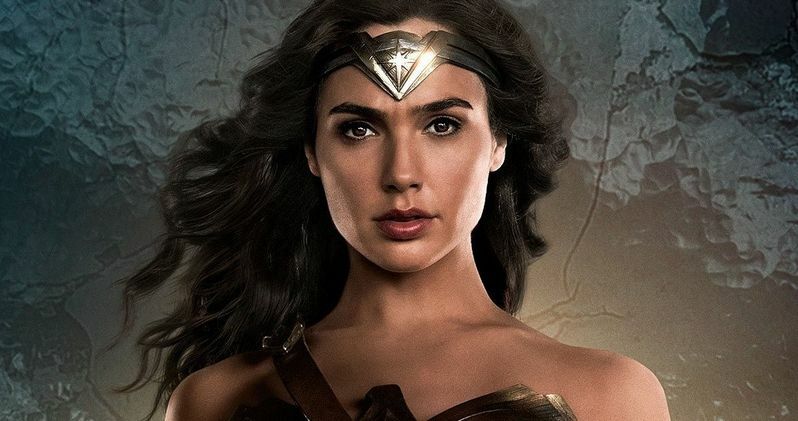 As expected, the studio has unveiled its latest preview for the new trailer, focusing on the iconic Wonder Woman, played by Gal Gadot, with the actress unveiling her new character poster on social media. In the Wonder Woman preview, which Warner Bros. debuted on Twitter this morning, Gal Gadot is shown in her civilian attire, examining an ancient statue, with the remaining shots showcasing the actress in her full Wonder Woman costume, as she uses her powerful Bracelets of Submission to create another energy blast. Following suit with all of the other Justice League trailer previews, this brief video ends with a brief shot of Batman (Ben Affleck), Wonder Woman (Gal Gadot), Cyborg (Ray Fisher), The Flash (Ezra Miller) and Aquaman (Jason Momoa) standing side-by-side. It is expected that the studio will also release a preview for Ray Fisher's Cyborg later today, but the big question is whether or not the studio will debut a Superman preview. At the end of Batman v Superman: Dawn of Justice, Henry Cavill's Superman sacrificed himself so he could kill Doomsday and save Batman, Wonder Woman and the rest of the city. The movie ended at Superman's funeral, with the final shot revealing a pile of dirt dropped on Superman's casket, with the particles levitating for a split second, before the movie cut out. Clearly, Superman will make his return at some point within the Justice League story, with director Zack Snyder going so far to say in a recent interview that Superman does play "a big part" in the movie, and both his presence and lack of presence are "major story points." Before Justice League hits theaters this fall, fans will get to learn much more about Gal Gadot's Diana of Themyscira in Warner Bros.' stand alone Wonder Woman movie, which hits theaters June 2. The movie is said to take place over three distinct settings, London during World War I, Diana's homeland of Themyscira and in present-day, which will help set up Diana's return in Justice League. In Batman v Superman, Ben Affleck's Bruce Wayne found a photo of Diana in Lex Luthor's files, dating back to World War I, making her more than 100 years old, and this stand alone story is expected to delve into Diana's origins before bringing her back to present day for the Justice League movie. Fueled by his restored faith in humanity and inspired by Superman's selfless act, Bruce Wayne enlists the help of his newfound ally, Diana Prince, to face an even greater enemy. Together, Batman and Wonder Woman work quickly to find and recruit a team of metahumans to stand against this newly awakened threat. But despite the formation of this unprecedented league of heroes, Batman, Wonder Woman, Aquaman, Cyborg and The Flash, it may already be too late to save the planet from an assault of catastrophic proportions. Zack Snyder directs Justice League from a script by Chris Terrio, with Warner Bros. setting a November 17 release date. Take a look at the Wonder Woman trailer preview and character poster for Justice League, as we get closer to the new trailer's debut tomorrow.